There's a sketch challenge at Just Us Girls this week! 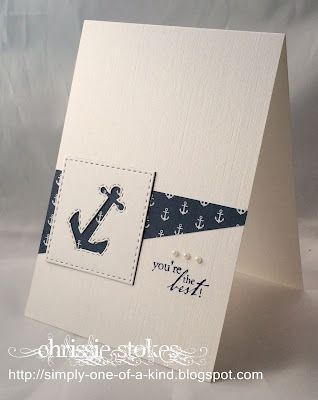 My version uses an anchor die from My Creative Time within a die cut from Simon Says Stamp. A touch of DP and a Hero Arts sentiment and that's it! This next card is for a couple of challenges. A Day for Daisies and CASology each have the theme Plaid. I paper pieced some Pink Petticoat paper onto the chicken and added a computer generated sentiment. Now to work out a design for some orders of service for my DIL's sister's wedding! Two fabulous cards. I love your take on the sketch challenge - just brilliant! Loving your nautical card. The layout and the creativity is so striking. Had a little chuckle at your Plaid card, such fun and good luck with the OOS's. 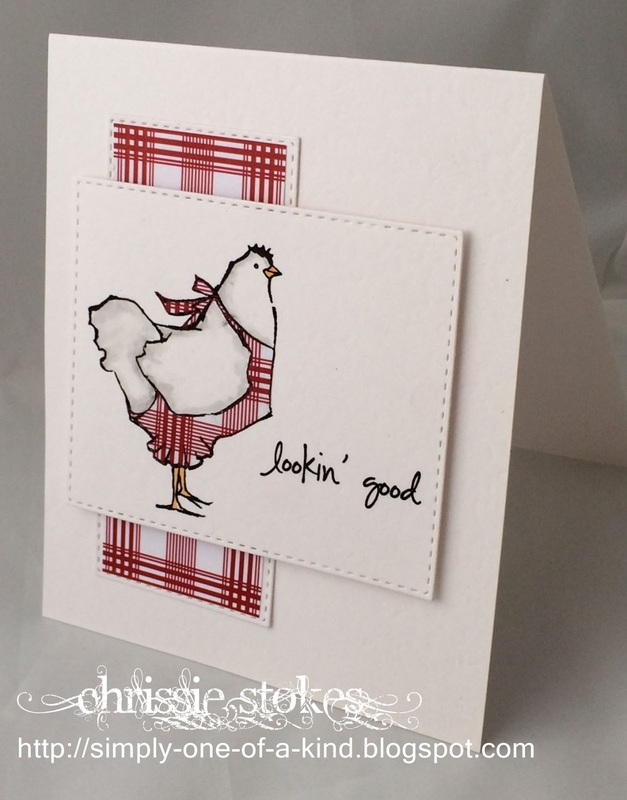 Love the country-feeling of the red and white plaid with the chicken! So glad you joined us at CASology this week, Chrissie! Both cards are amazing but that chicken card is beyond adorable! Super great plaid! Love it and the clean and simple design using the ADFD image is just right. Thanks so much for joining our challenge this week and look forward to seeing more! Take care. 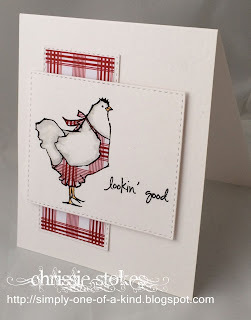 Oh, your chicken card is so cute! I love the strip of matching plaid behind him! Great cards! What a great take on the sketch! Gorgeous cards! Thanks for joining us at Just Us Girls! Both cards are terrific! I love that chicken!! Where is it from? I'll have to search for that one! Thanks for joining us this week at Just Us Girls! 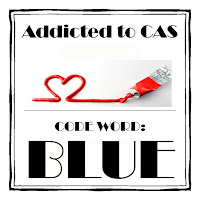 Oh my gosh - that is gorgeous - I love your CAS card! Thanks for joining us at our A Day for Daisies Challenge - Add Plaid. Please join us again soon. These are both lovely, Chrissie!!! Love the anchor one and that plaid chicken is just so cool!!!! Such cool designs, Love these cards. Thank you for sharing with ATCAS! Love both of your cards. Thanks for joining us over at ATCAS. great design. Loved your both cards. Thanks for playing along with us at ATCAS! !